You too can have a long beautiful Mane! ~Any color you want~ its ALL possible! Neat clean even sections NO GLUE!!! With our SAFE method there is No glue, No heat, and No Chemicals! plus you never have to take them all out! like with "Other" methods. Also, our hair quality allows our clients to re-use their hair, so there is no need to waste or re-order every three months! Take down is a snap plus, with no glue bonds to worry about, the hair can be easily repositioned at any time. 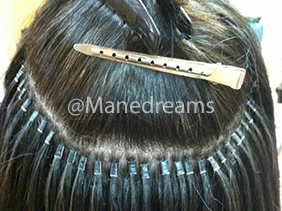 With Mane Tubes you can secure any and all Hairpieces or wefts as needed. This is a typical glue removal. Removed with force, acetone and plyers. Most of her hair was ripped out of her head. This was taken three weeks AFTER glue was removed. Glue, fusion, protein, wax, its the same... GLUE- very damaging and the results can be permanent. 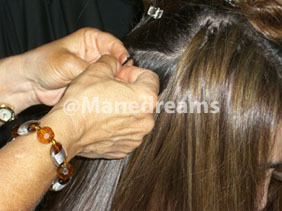 Mane Tubes, is a "Cold Process" for applying hair extensions, that is safe for ALL hair types. Since our hair is re-usable over several applications, we offer "in-between" maintance services so you never have to experience a full take-down. We also guarantee the quality of our hair from Italy, Russia, and Spain insuring lasting results with your investment. Mane Tracks. And featuring our newest addition~ Mane Secret Hair addition!!! The Mane of Your Dreams Hair Extension System/Mane Tubes starts with 100% human hair from Europe. It is then applied using an unique cold application by a certified stylist. Unlike other methods, the process uses no braiding, chemicals, sewing, heat or glue and is completely safe and painless to apply. With Mane Tubes, there is no tension, stretching, chemicals or heat used during the application or the take down process. Our methods are the safest extensions available today. Can you see them? How do I care for my extensions? 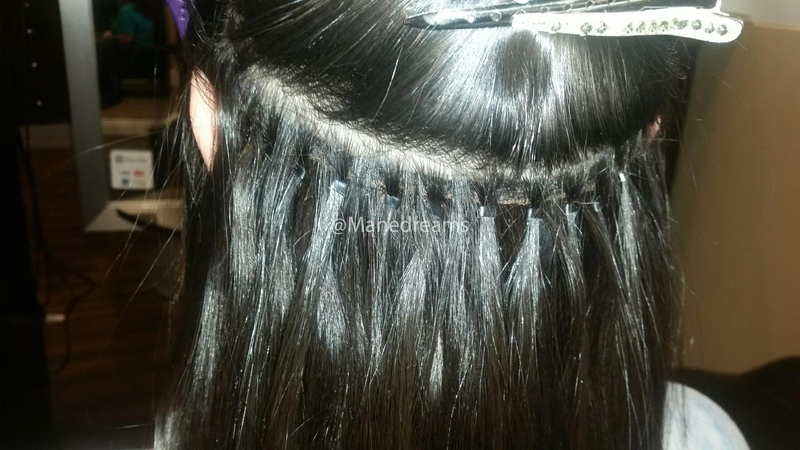 The extensions are always applied behind the hair line and away from the natural partings. The unique shells are color matched so they blend naturally with your hair and are virtually undetectable! 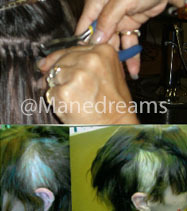 With Mane Dreams, you can color, perm and style your hair like normal. Even use your favorite hot tools like flat irons and hot curlers. Absolutely. Your certified Mane Tubes Specialist will match your color and texture perfectly. Custom blending is our specialty! Properly placed ManeTubes are Un-Detectable! Your "Locs" will always match the root color. the sections are clean and follow the hairs natural growth pattern so you have no tension hairloss! Other systems use glue and heated bonds to melt the extensions into your hair, no re-use of the hair and sticky bonds make the take down process longer than the application... not to mention the potential damage to clients who have fragile hair to begin with. A awesome way to hide your thinning hair.... it completes your installs so well!